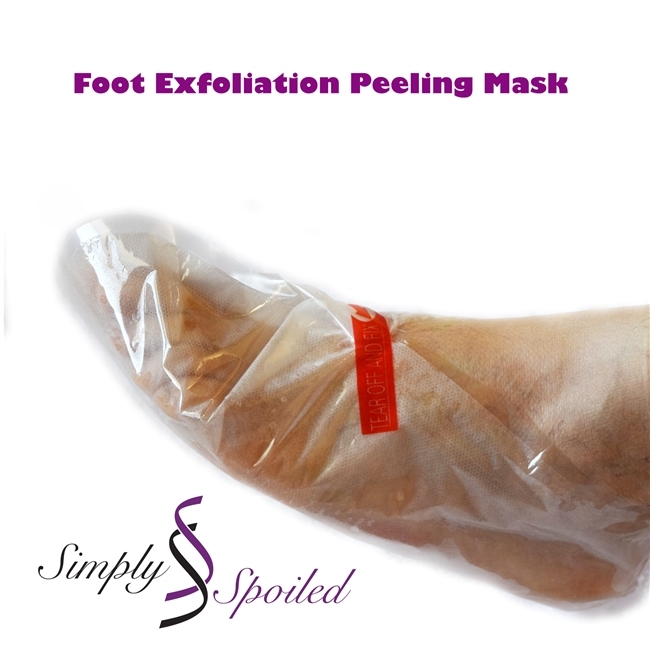 Simply Spoiled Foot Exfoliation Peeling Mask Includes 1 Pair Easily treat yourself to soft feet. Remove callouses and rough skin in a single 60 minute treatment. Powerful botanical extracts work for you. No scraping or scrubbing required. Dead skin peels right off in about a week, leaving fresh new skin. Perfect for men and women. Adjustable closure allows mask to fit most sizes. Complete instructions included with product. Active Ingredients: Water, Alcohol, Glycerol, Lactic Acid, Malic Acid, Sorbitol, Butylene Glycol, Papain, Aloe Vera Extract, Citric Acid, Salicylic Acid and other extracts. For external use only. Do not apply to wounds or damaged skin. If skin becomes irritated stop use, keep out of reach of children.